“Taka Talk!” is a weekly language workshop for students wanting to prepare for the ever-expanding, interconnected world that people live and work in daily. The intent of the workshop is to help those who attend learn choice phrases, cultural information and social aspects of communicating with Japanese speakers. Taka Talk! is the brainchild of Yangok Chu, an instructional assistant in the Modern Languages department and Takahito Kikuchi, an East Los Angeles College Japanese tutor. 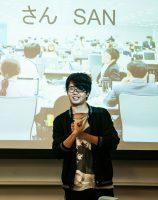 Chu had the idea of creating the “Taka Talk!” workshop with the idea of globalization as one of the main focuses. Kikuchi later came onto the workshop team with various ideas of how it could reach students, each combining their efforts to find ways to attract all types of students. This is a workshop that is inclusive to those who don’t speak Japanese, are fluent and everyone in between. Being an instructional assistant in the Modern Languages lab, Chu wants to make sure that students understand the benefits of this workshop. “I want students to understand the advantages of speaking a second or third language, not only for the sake of their future marketability, but also for the personal enrichment and cognitive health benefits that only seeing the world through a new language can offer,” Chu said. She also said that with more students than before getting higher degrees, it is important for students to set themselves apart from the pack. “You want to have something else that separates you from the rest of the college graduates. Of course language and a global outlook are going to be two of those defining/dividing factors,” Chu said. Kikuchi is a Japanese tutor at ELAC and has aspirations of one day becoming a professor. He was given the chance to run “Taka Talk!” with the idea that simply talking about the language wasn’t enough. By talking about the language and the culture combined, the workshop would be able to give those in attendance the perspective of a Japanese person. The flow of meetings comes from the collaborative efforts of Chu and Kikuchi. When it came to themes or ideas for meetings, Kikuchi would bring up a point and Chu would have suggestions or, at times, add to it. “She gave me a lot of freedom to do what I want,’ said Kikuchi. Both put time into figuring out what the workshop would end up being. In the beginning, Kikuchi said that it seemed that he would be talking the entire meeting. He didn’t think that was the best approach, especially not with the students. “What’s more important than understanding or learning about a culture is to question it or be able to discuss about it. Like to say what your opinions are,” said Kikuchi. In an effort to create an atmosphere of interactivity Kikuchi integrated the app “Kahoot!.” “Kahoot!” is used as a learning tool that combines a learnable subject with fun games. The app was used in the first meeting to great effect, giving everyone present a chance to learn about culturally significant things and participate in activities as a group. Kikuchi took the time between answers to give information about the topic at hand. One question focused on the differences between American schools and Japanese schools. Kikuchi took a moment to explain how grade levels were separated in Japan as opposed to how they are broken up in the United States. Kikuchi reiterated that this approach allowed different people the chance to learn something new. Each meeting will have topics that students would be interested in, but there is no set schedule and topics can be influenced by current events. “We want to keep it flexible and appropriate for the time,” Kikuchi said. “Taka Talk!” holds its meetings every Monday from 11:30 a.m. to 12:00 p.m. in Modern Languages lab, E7-107.